Organic new potatoes. Their loose, delicate young skins provide lots of flavour, so don’t peel them – just scrub gently in cold water. Boil to waxy tenderness, anoint with butter, salt and shredded mint – a salute to spring. When you tire of buttery new potatoes (if that’s even possible), branch out. Eat boiled potatoes in a classic mayonnaise and chive salad. Or toss with a bouquet of spring veg – broad beans, artichoke hearts and wet garlic. New potatoes also roast well, especially with a few sprigs of rosemary and cloves of garlic. Any leftover boiled potatoes make fantastic rosti: grate and fry until golden. Partner with spinach, a poached egg and a grinding of pepper to set you up for the day. Delivered from our farm, so wash before cooking. Keep cool and dark on a veg rack. 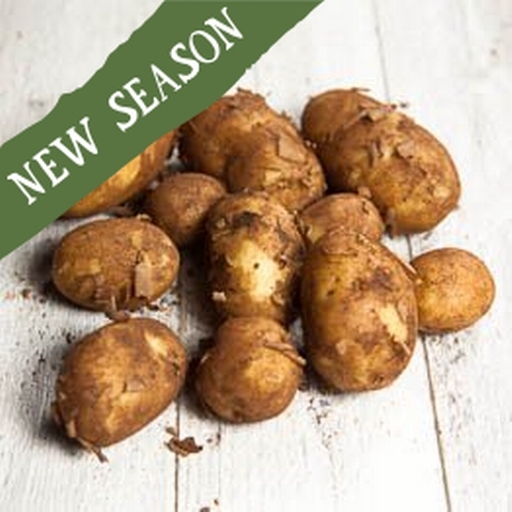 New potatoes are best eaten as fresh as possible. Our varieties include Lady Crystal, Colleen, Agita, Charlotte and Accent.